Personal experiences and advice for those facing hard times. 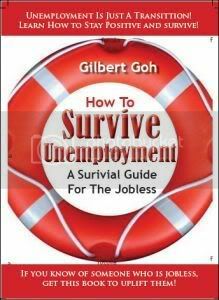 “How to survive unemployment: A survival guide for the jobless” is a book written by Gilbert Goh. It will be launched at a forum this Saturday, March 7, at the Bishan Library. Gilbert, father of a 15-year old daughter, is one of the founders of the website transitioning.org which is also dedicated to helping those who are retrenched or unemployed. Currently working on a short-term contract as a private school teacher, Gilbert describes the book as a “survival tool kit”. It aims to help those looking for jobs by providing suggestions on how to go about it. As one who had gone through a period of unemployment and financial difficulties some years ago, Gilbert also shares his own experience with personal stories in the book. Already some donors have bought more than 200 copies of the book and Jobstreet, the Internet recruitment website, will be helping to distribute the books to the unemployed at the job fair at Suntec City on Sunday, March 8. The book, which is about 120 pages, will be sold for $11 at the book launch at Bishan Library. Major bookstores will retail the book at $15.